In her later years, Julia Child partnered up with just about every chef and luminary in the world. 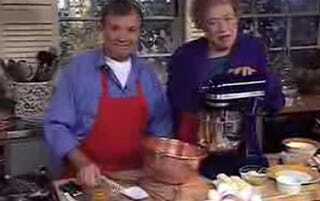 But I had to end the week with a clip of Julia and Jacques Pepin, one of television's greatest pairings. Jacques and Julia was a bizarre and inspired combination: him, long-suffering and patient and oh-so-French; Julia, completely un-self-conscious and batty. Almost every episode featured various skirmishes over proper procedure, and here's an awesome clip reel of some of the best. P.S. Just for kicks - or the totally baffled equivalent thereof - check out this beyond-odd interview.